My first bike was a Schwinn Pixie, circa 1971-ish, complete with training wheels and and white sparkly grips that matched the white sparkly vinyl banana seat. I was a stringy, lanky, knobby-kneed kid well into my late teens, so I outgrew it quickly—not only physically, but also stylistically. 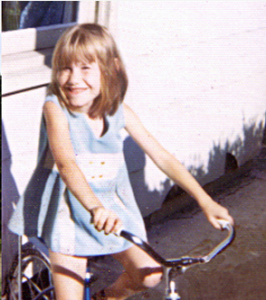 Even at the age of six I was becoming quite the tomboy, much to my parents’ chagrin. Despite all attempts to girl-ify me with ribbons and bows, pretty dresses and pigtails, I was always ready to rough and tumble with the boys…including riding my girlie bike in the dirt lots behind the school. We rode off of ramps. Into bags of sawdust. Down stairs. Just like the boys. Fast forward a few decades and I’m back to riding around in the dirt with a bunch of boys. It was quite accidental. There I was, just riding along, training on my road bike, when I was struck down by a driver in a truck. Over the months and years following my accident, I discovered I was no longer able to road bike the way I always had. Despite extensive therapies, I was very limited, and in a great deal of pain, constantly. I rode anyway, because I’m a cyclist. It’s what we do. It’s what we love. But eventually the pain won. Around that time a friend suggested I try mountain biking s a sort of last ditch attempt to find a way to keep riding. Oddly enough, it worked. How it worked, and why, wasn’t immediately clear (though it is now). The important thing is, I found a way back to the thing I love most. Dan Millman—a sort of All-American yoga guru who was way ahead of the “yoga” curve—perfectly encapsulates this sentiment with his quote about finding the love in what you do. Millman would know. A motorcycle accident left him with a shattered femur, ending his career as a gymnast. An Olympic hopeful, the tragedy also shattered his identity, bruised his ego, and crushed his spirit. Doctors told him he might learn to walk, but would never be a gymnast, again. Millman persevered, defying his doctors’ prognosis; not only did he walk again, he returned to gymnastics, first as an athlete, then as a coach. Like Millman and his journey back to what he loves, I discovered that while I could no longer road bike very well after my accident I could ride a mountain bike without pain. There was just one problem—I had no skill. 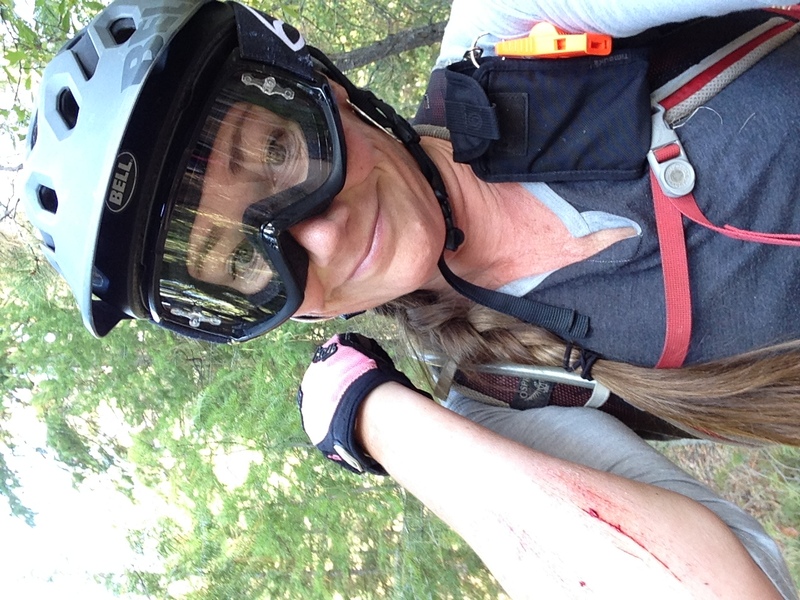 The Trek Dirt Series and Lindsey Voreis’ All Ride camps weren’t a thing yet, so I had to learn the old fashioned way—trial and error. Mostly, it was a lot of error. I had to work damn hard to be a pretty mediocre rider, but eventually the skills came. Most people go the opposite direction as they age. They start to slow down, become more cautious, take fewer chances. But I believe this approach is one of the reasons we start to feel old beyond our years. If we aren’t learning and being challenged and trying new things, we atrophy. This is true both mentally and physically. Yes, it’s true as our bodies age it is wise to be cautious. Injuries take longer to recover from; our body’s capacity to heal slows. But taking no risks means life becomes bland and tasteless. 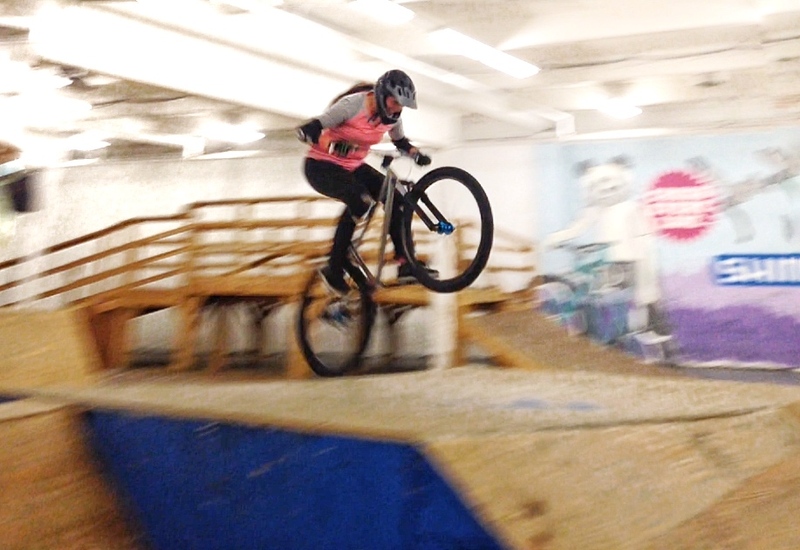 This past January, I began riding a dirt jump bike a couple times a week at the local bike park. 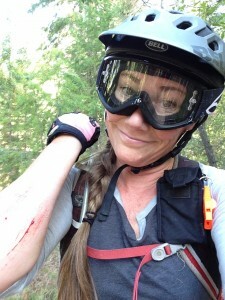 I wanted to challenge myself to learn something new, but also to improve my handling skills on the trail. 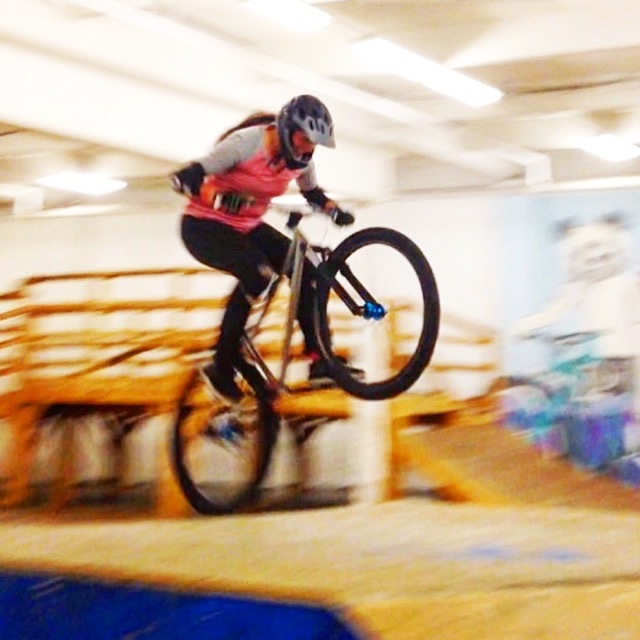 In Portland, where it rains sometimes 5 months out of the year, an indoor bike park is a welcome means of exercise, play and social interaction for both kids and adults. Riding at the Lumberyard and working on riding pump tracks, jump lines, and other stunts has absolutely paid off on the trail. I’m faster than ever, despite diminishing fitness, simply because my skills have improved. In addition to paying dividends in the trail handling department, it’s also an incredible workout. Throw in that it’s just a ridiculous amount of fun and it beats the hell out of going to the gym to work out. After three hours of throwing down laps on the jump lines, I’m soaked in sweat, muscles trembling with ecstatic exhaustion, sporting a huge smile. Most of the time, I am the oldest person there. Even when there are other “old people” present. Mind you the average age of the people at the bike park is probably 13. For three or four hours at a stretch I forget my troubles and enter a child-like place of pure absorption. It is not unlike the satisfying feeling one gets from a great meditation or yoga practice. In fact, in my view, it IS a yoga practice—a practice of being completely present, without distraction, and becoming completely absorbed in the moment. It is “bike yoga”. Recently an article was published in several news channels, where things I’ve said and done were misrepresented. For the record I am not actually a 49 year old BMX racer. That’s crazy talk! I am, however, a bike riding, dirt jumping, beer drinking, poetry slamming, book writing, single-speeding tomboy girlie girl who recently celebrated the 10th anniversary of her 39th birthday. And I happen to love hurling myself through air, harnessing and defying gravity, sometimes at the same time. Often when folks “my age” do youthful things like BMX riding, we’re accused of having a mid-life crisis. But if challenging oneself to learn new things and have fun is a mid-life crisis, well then… sign me up for a permanent mid-life crisis. Because this girl is convinced that the fountain of youth is one where laughter and learning bubble up from risk and reward.